Want to increase the number of likes on your Instagram posts? Don’t feel like you’re getting enough credit for your posts? There are several reasons that getting more likes on Instagram is good. First, it shows that you have an engaged audience and it makes your page look better. This is especially true if you’ve previously struggled with a low engagement on your Instagram page. 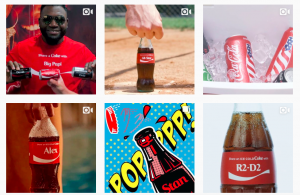 The second reason why getting more likes on Instagram is important is that it can help increase the chances of you getting your post featured on the Search & Explore page, but also top posts on hashtags and locations. Getting lots of likes is, in that sense, like a slippery slope where lots of likes lead to even more likes and exposure. On Instagram, 95 million photos and videos are shared on Instagram per day. What’s more, over 40 billion photos and videos have been shared on the Instagram platform since its conception. There’s no denying that the competition of being seen and cutting through the noise is extremely difficult, and to do so, you need powerful methods to get your content in front of more eyeballs and ultimately gain more likes. In this article, I am teaching you How To Effortlessly And Quickly Get More Likes on Instagram. Hashtags are known to be the most effective tool for getting more exposure and being discovered, so obviously, I cannot ignore hashtags when writing this article. If used correctly, hashtags will help you get more engagement (likes) on your posts, get your account discovered by new people, and ultimately give you new followers. As a brand, it can even lead to new customers as a result of your increased exposure. To bring the actionable steps to using hashtags effectively, there are some things we need to sort out first. This question is quite interesting, and I’ve spent of lot time researching the real truth. And the truth is, unsurprisingly, that the more the better. Instagram allows you to use 30 hashtags, so why not use them all? If you use 30 hashtags, you’ll get your post displayed in 30 places, while if you only use 20 tags, for example, your post will only be visible in 20 places. The math is quite easy. 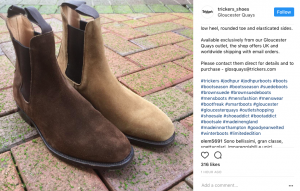 Tricker’s shoes take advantage of this and include 30 hashtags in every single post. And they are doing quite well. This one is quite obvious, but I still feel like I need to point it out, because I’ve come across a lot of people who want to get tons of likes on a low-quality, boring image, and the two just don’t go together. The reason people like a post is because they actually like the post, but if it’s straight up bad, why would people want to like it? There’s no template that will tell you “This is amazing content” because it varies depending on the audience. If the content you share is completely irrelevant to the people you are targeting, it doesn’t matter how good the photo you’ve shared is. They simply won’t care, and will just scroll past it – thus preventing you from receiving a like. BUT: here is a template that helps you create the perfect Instagram post because the foundation of creating a great Instagram post still remains the same – no matter what niche or business you are. Make sure you have researched thoroughly what type of content resonates well with your audience and share that! If you have converted your account to an Instagram business account, you can go to Instagram Analytics and tap “Posts”. Here, you’ll see a list of the most popular posts you’ve shared, and you can also choose to filter your posts based on different criteria and time-spans. The reason you should do this is that the top, respectively the bottom posts will tell you a lot about what your followers like – and don’t like. Take a look at the posts that are located at the top. Do they have anything in common? Are they posts of the same motive or are all of the videos? Usually, certain things can be distinguished from the top posts in your Analytics, and this will allow you to understand what works well, and implement that into your content strategy to share content that gets more likes and a higher engagement. 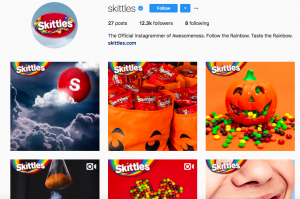 Skittles know their audience very well and receive great response from the posts they share. When it comes to sharing amazing content, I can’t help but talk about the quality of the content, because it is so extremely important. We live in the 21st century, and today, almost anyone can take a good image that isn’t blurry and looks like it was taken with a rock. The phone you use has a great camera, but still, people share blurry and low-quality images. If you want a surefire way to decrease your engagement, share low-quality images. Continuing on the post you share, because it has the biggest impact on how well it performs. After all, people like the post. Nothing else, so you can expect the post itself to play a huge role. It is proven that certain colors perform particularly well on Instagram. In fact, pictures that are primarily blue get 24 percent more likes compared to photos with red as the primary color. What’s more, photos with a single unified color scheme get 17 percent more likes than those with many different colors. It is also greatly effective to have a consistent color scheme as a brand because then, people will start thinking about you when they think about a particular color. Now, you don’t necessarily need to add filters to every single post of yours, that is not what I am saying, however, studies have found that filters with certain personalities lead to increased likes. This means that you can also edit your photos to have those personalities and you don’t have to use filters all the time, because, well, filters and edited photos are basically the same. They’re essentially just edited differently. Researchers from Yahoo and Georgia Tech found that while filtered photos get more engagement. 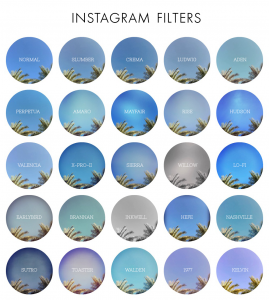 They also found that filters that increase contrast, correct exposure, and add a warmer tone to photos increase likes on Instagram the most. Instead of using a filter, you can also use Instagram’s built-in editing tool to achieve the things mentioned above with your image. What do Stories have to do with this, right? Well, Instagram Stories can actually work as a tool to promote your posts, and more and more people can be seen using it for it. The fact that the view-rate is quite high on Stories results in the fact that people might watch your Story but miss your post, and this is why the tool can be helpful in getting more likes. 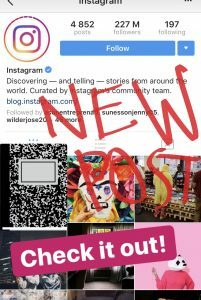 The most common way that people use Stories to promote their latest post is to take a screenshot of their feed, add it to stories, and then hide their latest post, either by using stickers or by painting on it. It is also effective to add a call to action, or at least a text where you let people know that you’ve shared a new post and that they should go check it out. If you want to be more creative, you can build a bit of mystique, and talk about the subject you’re discussing in your post. You can even create a poll where you ask people questions that are relevant to the post you share, and then ask people to visit your post for more. The time of which you share a post had a greater importance back in the days, before Instagram’s introduction of the update that would completely turn upside down on the way content is presented in your feed. The Instagram algorithm. Before the update, the posts in your feed were presented in a chronological order – the most recent posts from people you follow at the top and the oldest at the bottom. As you can imagine, when you posted was quite significant, because if you posted a photo when your followers weren’t online, your post would be bumped far down by the time they log in – potentially keeping them from seeing your post, thus keeping likes from you. While it’s not equally important today when you post, it is not completely irrelevant, because Instagram doesn’t want to present posts that are several days old at the top of your feed, because it just won’t be relevant. 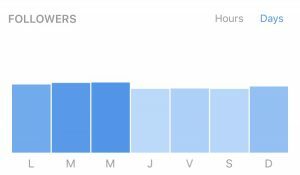 If you’ve converted your account to a business account, you now have access to e. There, you’ll be able to see which days, and more specifically which hours on those days that your followers are most active on the platform. In other words, how many times they log in to the platform. Based on the information you can extract, start sharing posts when most of your followers are online. Now, this does not mean that you need to make every single post you share a selfie, however, sharing a post every now and then with faces in it can significantly increase the number of likes on that post. When you post too much, you’ll end up cluttering your followers’ feeds and if they get really mad, they might even decide to unfollow you. Over 14 thousand posts! It doesn’t matter if you have had your account since Instagram first started (I know this account didn’t). Having posted over 14K posts is spamming your followers. 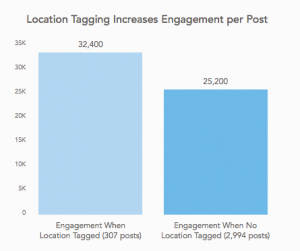 Did you know that posts that have been checked in to a location receive 79% more engagement than those without? Well, it’s true, and it is quite a significant number. Adding a location to your post is super easy, and it is something that you should do to every post you share. While it is the visual you share that has the most power in deciding how well your post performs the caption still has a lot of importance. 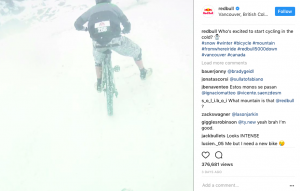 Creating a powerful caption is an art that takes time to master, but doing something simple as including a call-to-action can dramatically increase your likes. Something you can see people doing on Instagram is to use the like-system as a way for people to vote. They might share a photo of a dog, and write “Like if you love dogs”. In other words, you want to create a caption that is relevant to your audience and then include a CTA that people should like your post if they “agree” or if they “like the picture”. The bottom line is that you should include a strong CTA that your audience will resonate well. If you have an account dedicated to dogs, chances are that all of your followers will like dogs, so including a CTA where you ask people to like your post if they like dogs will have a huge effect. Since Instagram introduced the algorithmic feed, and the engagement for people’s posts started to decrease, users have tried to come up with ways to “hack” the system and increase their engagement. An engagement pod, also known as engagement group, is normally an Instagram Direct Message group of 15 users (15 being the maximum number in a group) of like-minded users and accounts within the same industries. Every time someone shares a post, they also share it with the people in the group, and then the pod members will click on the post and engage with it -quickly. This encourages other users to engage with the post as well, and the quick engagement helps for getting the post featured in the Search & Explore page as well as the top posts. Most of the time, you’re invited to engagement pods but people in your industry, because really, that’s the only want to join an already existing one. If you’d like, you can also create your very own engagement group and decide yourself which accounts you want to invite. Sometimes, people also ask if someone wants to join their engagement group on Facebook, in an Instagram post, or on Instagram Stories. You just need to keep your eyes open. Engagement pods have been debated quite a lot recently, and to some, they can sound a bit sketchy, however, Instagram pods are not specifically prohibited by Instagram. Some people argue that Instapods can be a headache because it will force you to engage with whatever posts people share within your instapod circle – even if you don’t like what they post. As a result of this, there’s no authenticity and sincerity in the engagement. However, that’s the wrong way to approach it because you should only be joining pods with likeminded folks who post the same type of content that you share and are interested in. The pods you join should consist of people who all like each other’s posts, and there’s nothing inauthentic about that. If you don’t feel like Instapods are something for you, then don’t use them. But if you argue that it is dishonest to use them, then think again. Having an iInstapod is like having a refined feed for your top 15 favorite accounts – at least if you’re doing it the right way. Engaging with other users who are in the same industry as you, and share similar content will result in a huge upswing in likes. This is especially powerful and effective right after you’ve shared the post. When you’ve shared the post, search for hashtags that are relevant to your niche and start liking and commenting a bunch of posts. When you do, some people will visit your page and look at your posts. To show their gratitude, many of them will also return the likes, and maybe even leave a thoughtful comment. Among the actions you can take after you’ve shared a post, engaging with users is one of the most effective days to skyrocket the likes on your post. Posting consistently will help you increase the number of likes you receive. If you share consistently and regularly at similar times, people will know when to expect a post from you, thus increasing the number of people who see it. Have a posting schedule that you follow so that the posts you share go up at the same times every time. On the surface, the idea and willingness to receive more likes on your Instagram posts might seem silly. What are you going to do with more likes, right? But the truth is that getting more likes on Instagram is beneficial for many reasons – other than that it looks good and presents yourself as an established brand.